This Ireland equestrian vacation was featured in the February issue of Horse & Rider magazine's 50 Great Escapes and on Equitrekking on PBS and Horse & Country TV! Explore Ireland's famous Ring of Kerry with its lakes, mountains and golden sandy beaches on a six night riding vacation, staying in B&B's and small hotels to experience life in this stunning area of Ireland. Explore the highlands of Kerry, taking in the majestic MacGillycuddy Reeks, Ireland's highest mountain range as you ride the Ring of Kerry. The trail ride covers a variety of terrain including country lanes, forests, mountain tracks, bogs and some of the beaches in the area and on the magnificent stretch of golden sand at Rossbeigh. The Iveragh Peninsula stretches southwest from Killarney and has many places of historic and archaeological interest along the world renowned Ring of Kerry. Situated in the south-western corner of Ireland, with its three famous lakes reflecting the ever changing skies above the great mountain ranges, Killarney has been the inspiration of poets and painters for many centuries, and now it is also a thriving commercial and tourist center. Featured in the Equitrekking Irish Countryside episode as a part of Equitrekking’s second season. The Stables are approved by the Irish Tourist Board and the Association of Irish Riding Establishments (AIRE). Please see Equitrekking Travel's General Packing Suggestions. Riding helmets are obligatory in Ireland and current European standards apply. The weather in Ireland varies, but the climate does not reach extreme hot or cold temperatures. Layers are best, and travelers can pack their saddlebags daily with the necessities. Waterproof clothing such as a rain jackets, and rain pants that fit over riding clothes work well. Travelers that have full length rain coats need to ensure that these coats can be secured around the legs so as not to flap in the wind. Ponchos and cycling capes are not permitted. Riding in denim jeans is not advised unless travelers are used to doing so, as they may chaff the legs. Riding breeches/jodhpurs with chaps or long boots are recommended. Footwear must be supportive of the ankle and have a heel. Sun Block and gloves are also suggested, especially when accustomed to riding with them at home, the same applies to a riding crop. Each horse is fitted with a saddle bag, so riders may carry personal items with them, such as; rain clothing, water bottle, camera, sun block etc. The horses used for the trail are a mixture of Irish Drafts, Irish Cobs and Percheron Crosses. All horses have English saddles and bridles. The saddles are predominantly the ‘Swiss Ranger’ saddle, made by Peter August Spirig (Switzerland). These saddles are designed for comfort for the long distance rider and their horse, so extra gel pads etc. are not necessary, but if riders wish to bring them, they are more than welcome to bring them. Famed for the splendor of its scenery, Killarney is one of the world's best loved travel destinations in Ireland. It is the ideal playground for the sporting enthusiast. For those interested in history and archaeology, there are many outstanding items of interest to be seen. The town of Killarney has so much to offer in the way of shops, restaurants and hotels. Travelers may want to spend extra time to visit the Killarney National Park which is 10,289 hectares of lakes mountians and woodland. Country Kerry has the famous 'Ring of Kerry' driving/touring route in the south. Quaint Dingle Town is only one hour away. Riders and their non riding companions may enjoy: Fishing, Golfing, Hiking, Biking, Traditional Farms, Period Houses, Castles, Abbeys, Churches, Boat Trips, Gardens, Spas, Islands, Diving, Canoeing, Caves, Museums. Small family run hotels and Bed & Breakfast accommodations along the route. All rooms will have a private shower & toilet with towels. Foleys Townhouse, in the heart of Killarney with shops, pubs and restaurants within walking distance. During the 6 night vacation, you will visit and stay 2 nights in the village of Glenbeigh. The town is almost entirely surrounded by mountains, and the area offers a friendliness and humor which is found nowhere better than in this tranquil and charming region of Kerry. The scenery is breath-taking, with the River Behy and Rossbeigh Strand close by. The area is full of history and destinations such as Winns Folly Castle-- well worth a visit. Two additional nights are spent in the town of Waterville, meaning 'the little whirlpool.' Waterville is nestled on a narrow strip of land between Lough Currane and the Atlantic Ocean, in the very centre of southwest Kerry. Situated as it is between the seashore and the impressive mountains and headlands, the area has many interesting routes to offer and many fine beaches. The first Celtic invaders are reputed to have landed in Ballinskelligs Bay, coming ashore near Waterville. These beginnings of the Gaelic Nation are echoed by the archaeological remains such as those on Church Island, at Derrynane Abbey or Skellig Michael, giving the area a wealth of history. The last night is spent in Killarney. Breakfast is at your accommodations; full Irish or continental style breakfast. Lunch; Picnic style out on Trail (bread, fruit, meat, cheese etc.) Tea/Coffee/Water. Dinner is not included; all villages and towns have a selection of Pubs & Restaurants. While in Ireland, the traveler can expect to eat and enjoy traditional Irish meals which might include Irish stew, bacon & cabbage, Shepard’s pie, and a wide variety of seafood dishes. Dining in Killarney Town is second to none, with a variety of seafood and steakhouses, offering fresh local produce, from traditional Irish meals to more internationaly influenced fare. There are Restuarants, pubs and cafes to accomodate all budgets and tastes. Pleasure riders who are comfortable at walk, trot and canter in an English saddle, as well as travelers who are coming to Ireland to see the countryside from horseback and enjoy the company of the warm Irish people. Multiple languages are spoken at the stables for those of you traveling from international locations. Please ask us about this if you'd like to learn more. Riders may be as young as age eight. It is recommended that riders participate in horseback riding lessons for least 12 months on a weekly basis prior to riding with Killarney stables and that the rider is comfortable at the walk, trot, and canter outdoors and in an English saddle. Included: 5 days Trail Riding (4+ hours per day), 5 picnic lunches out on trail, 6 nights B&B accommodations, horse, tack & guide. Not Included: Price does not include evening meals, arrival or departure transfers. Transfers: Transfers are available from Kerry Airport to Killarney (c.10 miles). If travelling by bus or train, upon arrival in Killarney your hosts will collect you and transfer you to the stables free of charge. Alternatively you could rent a car and self-drive to the riding centre. * Prices may fluctuate due to currency conversions. If there is a group of 4 plus riders wishing to travel out of season please contact us and we can try to arrange special departures. Riding Ability: Novice through Advanced. All riders participating on the Trial Ride must be able to walk/trot and canter competently in an English saddle. It is advised that Western riders to take some English style lessons before participating on this trip in order to familiarize themselves with English tack and style of riding. The trail provides an unequalled opportunity to explore the highlands of Kerry with the majestic McGillicuddy Reeks, Ireland’s highest mountain range. Ride on country lanes and mountain tracks and some of the beaches at Waterville and on the magnificent 6.4k.m. (4 miles) stretch of golden sand at Rossbeigh. The Iveragh Peninsula, with many places of archaeological and historic interest stretches Southwest from Killarney for nearly 40 miles and is highlighted by the world renowned Ring of Kerry. Saturday is arrival day and check-in for all riders. There are no formal plans and no riding on this day as guests will be arriving at different times throughout the day. Everyone goes first to the Riding Stables to meet with your hosts and discuss your previous riding experience and general trail ride information. You will then be taken from the stables to your overnight accommodation in the Killarney area. On Sunday morning with horses, riders and all luggage ready, the day begins with a short trip to the base of Seefinn Mountain, (about 20 minutes drive) where the first day's ride begins. Once we have introduced horses and riders, the group heads off, and up over the Windy Gap, taking in panoramic views and the splendour of Caragh Lake and the valleys beyond. Oncce the Windy Gap has been conquered, the ride continues on to Coomasaharn Lake enclosed by Horseshoe mountain, followed by a scenic ride over an Irish Bog. The first day finishs for at our stables in Mountain Stage. Sunday and Monday nights are spent in the quaint village of Glenbeigh. (Glenbeigh comes from Gleann Beithe, the Glen of the Birch Trees). The village is almost entirely by mountains, and the area offers a famous friendliness and humour which is nowhere better found than in this tranquil and charming region of Kerry. Thescenery is breath-taking, with the River Behy and Rossbeigh Strand close by. The area is full of history and such a destination as Winns Folly Castle is well worth a visit. After breakfast on Monday the riders return to the stables of the previous evening to begin the second day of the trail ride. Today is spent on Rossbeigh beach, galloping through the waters edge and along stretches of golden sand. The day finishs with the ride taking the old Cliff road back to the stables with stunning views of Dingle Bay and the Dingle Penninsula. Tuesday morning brings the next move, so riders need to have all luggage packed and down stairs for when they are collected. Today is a relaxing trail, giving horses and riders a chance to recover after the last two days and get ready for the next two. The morning ride takes the group from Kells Station through the bogs of Cnoc Bawn and on to Liss Bawn, with some spectacular views of Caherciveen and its surrounds. It then continues on through Island Boy and the Inny Valley and finishes for the day alongside the Tulligane Woods, where we have an Old School House dating back to 1915. Tuesday and Wednesday nights are spent in the small coastal village of Waterville (meaning the little whirlpool). The village, nestles on a narrow strip of land between Lough Currane and the Atlantic Ocean,right in the heart of south-west Kerry. Its location between the seashore and the impressive mountains and headlands, gives the area many interesting scenic points and fine beaches. By all accounts, the first Celtic invaders are reputed to have landed in Ballinskelligs Bay, coming ashore near the village. The beginnings of the Gaelic Nation are echoed by the Archaeological remains on Church Island, Derrynane Abbey and Skellig Michael tp name but a few, thus giving the area a wealth of history. On Wednesday riders are brought back to the Old School House and the group has an adventurous morning in Tulligane Woods, riding through the Inny Valley and lunching back at the School House along side the Inny River. The afteroon ride takes a scenic route into Waterville along the old Glencar/Waterville road, with splendid views of the famous fishing lake - Lough Currane. Thursday is the final day of riding on the trail and also the day the last accommodation transfer is made. The morning begins with either a brisk ride to Waterville beach, enjoying some exciting gallops or a trip aroung the panorama of Hoggs Head and Ballinskelligs Bay (The tide dictates which one we do first) Once we finish riding for the day, its time for riders to say good bye to their horses and guide(s) before everyone and everything is transferred back to Killarney. This last night is spent in Killarney accommodation. And finally, Friday brings everyones departure, check-out after breakfast. 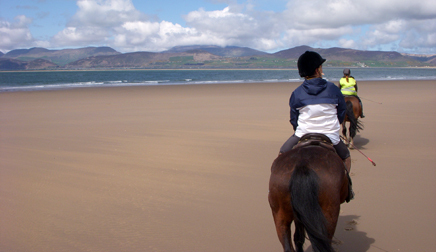 * This sample itinerary for this Ireland riding vacation is flexible. Itinerary subject to change based on weather, the trip guide's discretion or other factors. Please note that times for some rides are unpredictable to tell until the evening before due to tidal conditions. This equestrian vacation is featured in the February issue of Horse & Rider magazine's 50 Great Escapes! It was delightful to spend seven days on horseback, for up to 7 hours each day, riding through bogs, forests and galloping the beaches of Gleinbeigh. These rides were a dream alone but the personal attention we received was what made the trip memorable. Just wanted to tell you thanks for the great two-day trek. My friend, Anne, and I went together, as you might recall. We have children and pets and husbands and just couldn't get away for the full trek, but we'd like to come back and do days 3-4-5 next time! We've been corresponding with some of the other riders on the trek, the German girls, and we're all sharing stories and photos. You and your family really made our (rare) getaway a fantastic experience and one I'll treasure forever. Thank you so much for the wonderful ride, and for working so hard to accommodate all of us! It was a fantastic experience and everyone had a wonderful time. I really appreciate your willingness to work with us to ensure we had fantastic memories. We had a wonderful week in Ireland, luckily very warm, sunny weather. It was a thoroughly well organized trip. I can't say enough nice things about it. It was like a well oiled wheel. It really was a trip of a lifetime, thank you so much. On behalf of myself and my husband, I just wanted to send you a quick email to say THANK YOU!! Thank you all once again it was a very memorable part of our holiday to go with celebrating our 10th Wedding Anniversary. I just really wanted to say thank you again for the wonderful time we all had on the trail ride last week! It was the best holiday I ever had and I will surely come again. We'd like to thank you again for the nicest holiday we've ever experienced abroad! After returning to Finland, we decided to have the same experience all over again in summer 2010. Just a note to say I had a lovely time on the 5 day trail, and what a wonderful way to spend my birthday on the beach and a picnic, It was a good choice and worth considering again. I will recommend your stables and maybe see you all again sometime. It has been a week now that I have left Ireland, and I still have a hint of nostalgia. The trekking was fantastic and I was extremely pleased to discover the Irish countryside and its people. I just wanted to let you know that we absolutely enjoyed the short trip with you and definitely look into coming back (perhaps for the 5 day tour). The tour was very good, organized and the hotels were well chosen. Please also forward our thanks to the rest of your team, as everyone was very kind and helpful. minimum 2, maximum 10 - subject to change for group bookings. Novice through Advanced. All riders participating on the Trial Ride must be able to walk/trot and canter competently in an English saddle. It is advised that Western riders take some English style lessons before participating on this trip in order to familiarize themselves with English tack and style of riding. All horses have English saddles, and bridles. The saddles are predominantly the ‘Swiss Ranger’ saddle, designed for comfort for the long distance rider and their horse. All travelers are supervised by guides with special care taken of nervous or beginner riders. All levels of riding experience are welcome (walk, trot and canter depending on each individuals ability), and travelers are grouped according to ability. However, should you wish to arrange a mixed group your request can be accommodated. Children must be 8 years or older in order to participate. On average 4 – 5 hours each day is spent in the saddle. The rides vary depending on the day’s itinerary. April to October. May and June can bring rain and heavy winds to Ireland’s west coast. June, July and August are the warmest months. English, French, German, Spanish and Swedish are spoken at the stables.